One of the last lines, but it would have worked perfectly as the first. This is probably the most widely-read Batman comic that's not by Frank Miller. So of course it's by Alan Moore. Moore is an exquisite craftsman: the way this builds up tension is perfect. 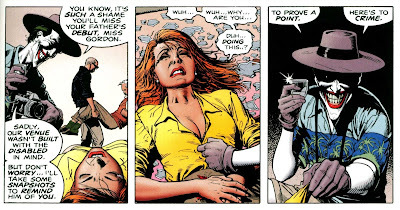 Of course, a large part of that's in the art, too, and Bolland and Moore make a helluva team here. It's great to look at and great to read. But: really, this is it? Why is this one of the most read Batman stories? It's nasty, brutish, and short, and it all seems to be in service of those last two to three pages, which are brilliant, I think. I love the idea that Batman believes he or the Joker must kill the other,* but all that really happens is they share a joke. And kind of a dumb one at that. (Though I am familiar with the theory that someone is dying on that last page, I'm reading this as part of a sequence of stories, so it definitely can't happen in this context!) But I'm not convinced this story says enough to justify its existence. I dunno, maybe I'm overthinking it, but I admired this story intellectually much more than emotionally. Well crafted, but sort of empty, and cruel. 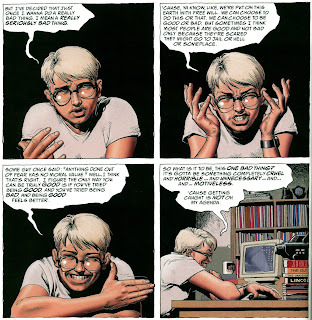 It seems pretty clear to me in reading The Killing Joke that Barbara was raped, but a lot of people (including Alan Moore, allegedly) insist that she was not. Again, this is something that I think changes if you view the story as in- or out-of-continuity. If it's out, then yes she was because there are some insinuations that don't make any sense if you don't think that's what they're adding up to. But if it's in, then pretty clearly not, because none of the subsequent 23 years of Barbara Gordon stories ever indicated something like that had happened. That said, the mental trauma this must have caused isn't really dwelt on at all by later stories, which mostly just focus on the physical act of crippling caused by Joker's bullet. 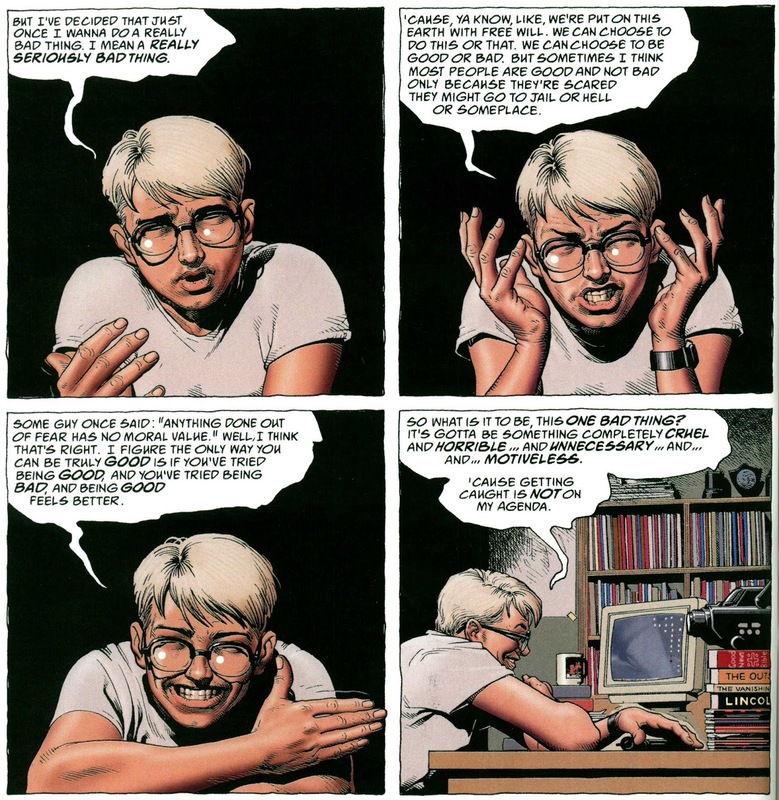 I did like "An Innocent Guy," an eight-page story written, drawn, and colored by Brian Bolland that is also collected here. It felt like "Harvey Pekar Does Batman," actually. Is that weird? Yeah, I know it's in color. * I must say, this sticks out as odd in the context of my readthrough, in which the Joker has a been a major villain in exactly two stories (The Man Who Laughs, Batman: Batgirl) and a minor one in a few others (The Long Halloween, Strange Apparitions, The Cat and the Bat). If the previous 28 stories were all I knew about Batman, I'd be hard-pressed to identify the Joker as his greatest nemesis! He's been curiously absent from these tales. I feel like Two-Face probably pops up the most consistently. Or maybe, strangely enough, Hugo Strange. I should make a chart and find out. Next Week: In Soviet Russia, Star Wars watches you! Batman tangles with the KGB in Ten Nights of the Beast!